We point out that the church runs a number of businesses and employs many people from outside. There are also a number of businesses which earn on providing goods and services to this entity. While the church is ever busy moralizing to us, we find it highly immoral that people connected with it would cheat on Social Security payments, leaving a worker without health insurance and with a break on payments counted towards retirement. 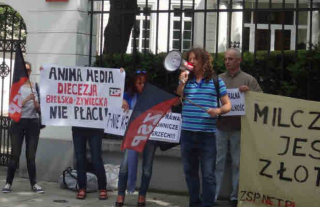 Since the last meeting in Bielsko-Biała, representatives of the church have not opened their doors to speak to the worker or to supporting protesters.